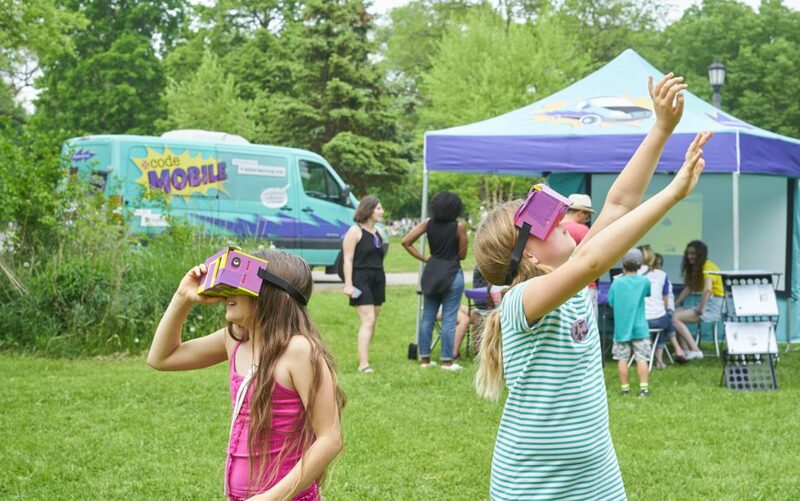 We’re travelling across the country to bring hands-on, interactive technology education to Canadian youth. It is our mission to ensure that all Canadians — particularly women and youth — have access to these learning opportunities. Our Code Mobiles offer fun, beginner-friendly, hands-on workshops that teach youth computational thinking and technical skills in a social and collaborative way. Each workshop includes a combination of kinesthetic ‘unplugged’ activities as well as ‘plugged’ activities using visual coding tools. 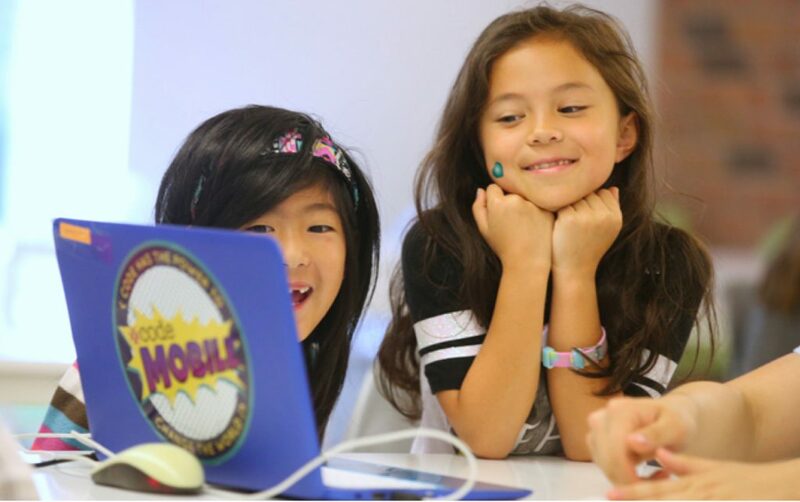 Through educational programs, like Scratch and programmable robotics, we aim to provide unique experiences for our learners by emphasizing collaboration and empowerment through technology. Art is everywhere - even on our computers! Using Scratch, a beginner level programming environment, learners will have the tools to develop interactive art and art-building platforms to share and use. Learners will also be introduced to Scratch's amazing online community, sloganed: "Imagine, Program, Share," where they will have the opportunity to upload their projects to share with fellow digital artists! From Checkers, to Super Mario Bros, to Angry Birds… we think games are awesome! Using Scratch, a beginner level programming environment, imagination will come to life in a new and digitally engaging form. Learners will also be introduced to Scratch's amazing online community, sloganed: "Imagine, Program, Share," where they will have the opportunity to upload their game for anyone on the web to download and play! At the end of the workshop, each learner will also have a chance to beta test their game with their peers. From Saturday morning cartoons to blockbuster films, animating has the power to inspire, educate, and entertain. This experience offers learners the opportunity to express their creativity in a super fun environment, and learn about the different elements of a story, as well as basic design principles. Using Scratch, a beginner level programming environment, learners will create interactive stories through animation. They will also be introduced to Scratch's amazing online community, where they will have the opportunity to upload their projects for others to enjoy! Tech Stations are excellent opportunity for learners to explore a variety of tools (ie. MaKey MaKey, Mozilla X-Ray Goggles, Little Bits, etc.) and coding concepts without having to commit to a full workshop. At each station, learners will have the chance to engage in a different interactive activity designed to bolster their confidence and teach them something new about technology. The flexible nature of these stations allows them to be easily adapted for a diverse set of experiences, including promotional boothing events, fairs, camps, and more! MaKey MaKey is a circuit board that uses electricity to make random objects function like keys on a keyboard. The circuit board plugs into our computer through USB, and then to our new “keys” using alligator clips. We can make something conductive, like a banana, turn into a space bar, or Play Doh turn into arrow keys. X-Ray Goggles is a tool that lets you edit a website directly in your web browser (similar to Developer Tools in Google Chrome). With Goggles, we can “hack” a website by creating a temporary version on our own screen. Learners will use post-it notes to program pixel art, through following instructions and creating their own pixel programs.